I previously wrote about how there are a lot of tourist attractions in Yilan. Much of this seems to be attributed to the amount of land and proximity to Taipei. There’s a lot of production going on in this part of the island. It’s no surprise, consequently, that there would be an alcohol distillery in the area, albeit a famous one at that. 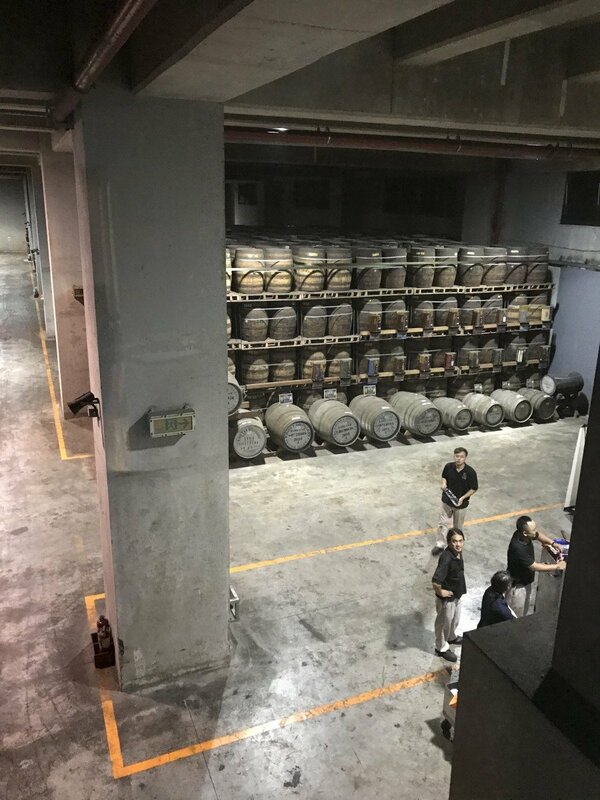 Kavalan (噶瑪蘭酒廠 / ga ma lan jiu chang) is a renowned Taiwanese whiskey (威士忌 / wei shi ji) distillery known for its numerous awards including beating scotch whiskeys in taste tests. The name comes from the Kavalan tribe of indigenous people who originally lived in the great plains area that is now Yilan. 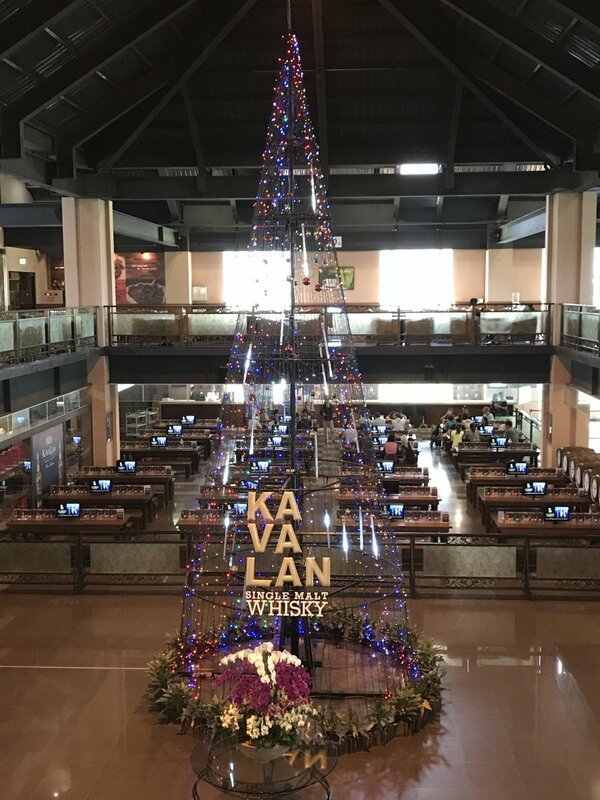 I first heard about Kavalan as one of a handful of items to bring back as gifts from Taiwan. Later seeing the Kavalan brand in stores across the island in the form of water bottles, I was excited to get the chance to drop by the factory to see how whisky is made. Our visit started in the cafeteria area which is on the top level. The cafe features a variety of snacks and sandwiches for purchase. This is the view looking down on the whiskey tasting area. We started our tour by first tasting a Kavalan whiskey. In retrospect, we probably should have started with the self-guided tour first and ended with tasting, but it is what it is. To taste their whiskey, we just needed to be of age and get in line. Every 15 or so minutes they let in a new group. They give each person a glass cup with a small amount of whiskey in it. You then sit down at a station. 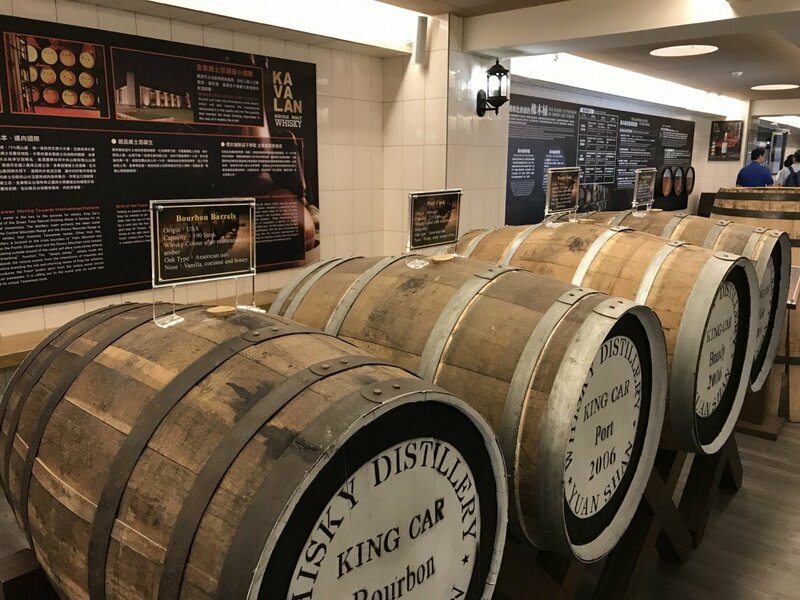 These stations have aromatic samples of Kavalan’s different whiskey varieties as well as the notes that you should sense. It was fun smelling them trying to get a sense of these flavors. They also have pencils for taking notes and water for diluting your whiskey. After a short talk from our host, the presentation was over and we were headed into the shop. After the tasting we headed to the beginning of the tour. 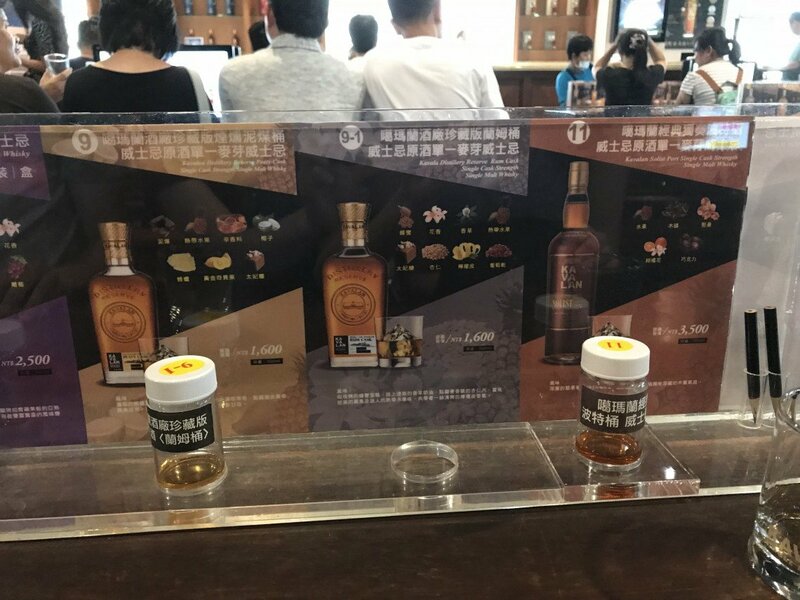 In a mix of English and Zhongwen, but mostly Zhongwen, signs showcased the history of Kavalan as well as the process of making whiskey. 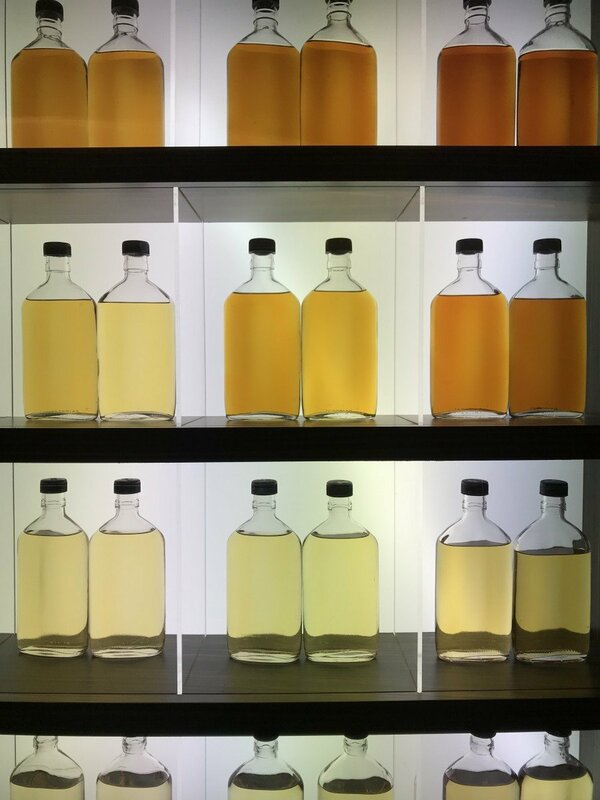 These bottles show some of the maturation process going from a light colored liquid to golden brown. Here’s one of the caves where the whiskey becomes aged. The whole complex is huge. It’s hard to figure out exactly where to start your journey but there are signs along the way directing you where to go. Just keep on going until you see a whole bunch of tourists walking around and start off with the tour first. I would recommend this to anyone who enjoys alcohol. It’s a boozy place that details the historied journey of the Kavalan brand. 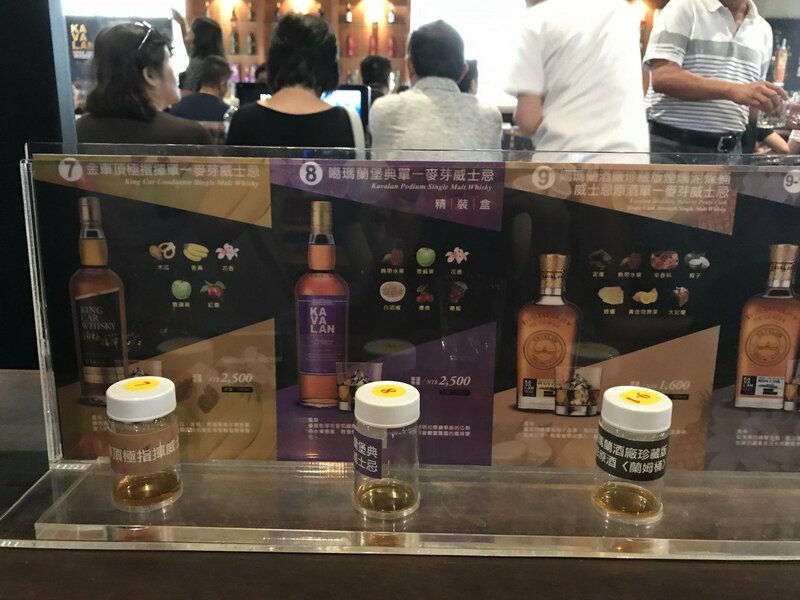 The post Touring One of Taiwan’s Premiere Distillers appeared first on Collecting EXP.